What is the word 'fair' in ancient Egyptian? Please. No, that means "beautiful, good, perfect". Well known is and very often used is "nefer netjer" as designation / epiteta for the King. Actually, it was "nTr nfr",the adjective coming after the noun. Thanks for correcting. Translation is not really my field, as I still said several times before... Is this a grammer rule ("adjective coming after the noun") in AE language or is this one of these "in-respect-towards-the-deity" thing? Don't worry. The language is very complex and hardly anybody's specialty. It was normal to put the adjective after the noun. Another example is "sn Sri" or "little brother". Yanother is "sxr pn bin" or "this evil counsel"--where even the demonstrative "pn" [this] comes between the noun and the adjective. But that's fairly easy. I'll show you what I mean by complex. What we think of as an adjective was expressed in some unusual ways by the ancient Egyptians. If we say "trusted servant", the Egyptians reduced that to "trusted one" but expressed it by "mH ib" or "fill [the] heart". The "mH ib" became a kind of noun then, like you say in German "Vertrauter". Example is " in mH ib n ity imi-rA niwt, TAty rx-mi-ra"
"by the mH ib of the sovereign, the imi-rA of the city, the vizier Rekhmire"
"imy-rA" means "overseer" but it is another odd noun, made up of two words. If one was loyal one was "Hr mw=f" or "upon his water". That's why there were really not all that many adjectives written by the ancient Egyptians--because they had other ways of expressing what we call adjectives. "mtr-maa" means as much as "right and just". "maa-jb" means "just / upright / fair". Is there a known ancient Egyptian word for unique? 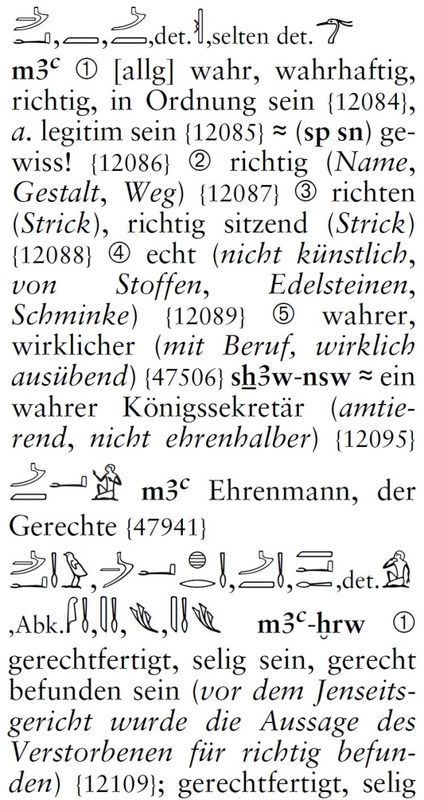 the best we have comes from Akhenaten's throne epithet, /Nfr-xpr.w-ra, wa-n-ra/, "Neferkheperura (throne name), unique (one) of Ra." Hence, /wa/ = "unique." /wa/ means "one", and in this sense, /wa/ probably has the sense of the "only one," according to Hannig (2000: 328A). Hannig, R. 2000. Die Sprache der Pharaonen: Großes Handwörterbuch Deutsch-Ägyptisch (2800 - 950 v. Chr.). Lexica 3. Kulturegeschichte der Antiken Welt 86.Mainz: von Zabern. [/quote]"maa-jb" means "just / upright / fair"